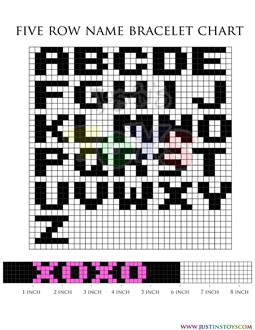 This variation of the name bracelet was created by Suzanne King of Rainbow Loom Murals and Pics facebook page and shows you how you can personalize a bracelet to have you name on it. It only takes one loom and around 200 to 300 rubber bands. To calculate how many sets of bands you need to apply, measure your wrist in inches and multiply it by 7. 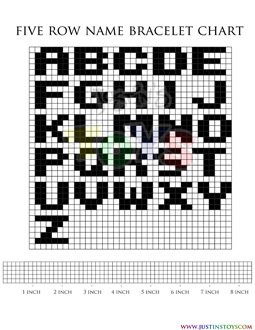 That will calculate how many rows of pixels you will need. Try using high contrast colors.